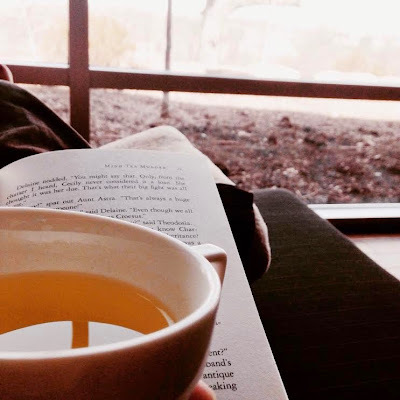 Reading and tea drinking are a natural combination (I was very happy in the picture above). I'm usually at my most relaxed when I have a book and a cup of tea (a cozy chair doesn't hurt either). 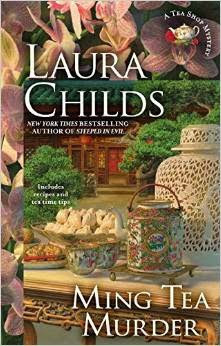 When Laura Childs contacted me regarding her new book, a murder-mystery laced with tea references, I knew I couldn't resist. I cracked open the book as soon as it arrived. Ming Tea Murder is an exciting mystery filled with tea and southern charm. The book revolves around the Theodosia, a crime solving, tea-shop owning southerner living in Charleston. The book starts with a murder inside an eighteenth century Chinese tea house rebuilt in a Charleston museum. We follow Theo and her friends throughout Charleston as they try to uncover the killer. I thought I had the murderer figured out right away, but I was completely wrong. I love that I was kept guessing until the very end. The characters in the book always go back to Theodosia's Indigo Tea Shop to recharge and relax after a stressful adventure. Childs is very vivid in her descriptions. I could smell the tea brewing and taste the scones and tea sandwiches (there are recipes at the end of the book for the reader to recreate the food). I enjoyed reading the details of themed tea-events at the shop as well. I think my favorite character in the story is Drayton, the southern gentleman with impeccable taste who manages the tea shop with class and panache. I can imagine sitting with him for an afternoon, sharing a pot of Formosa Lung Ching tea and homemade scones. He would probably tell fascinating stories all day long. This is an entertaining read that I'd recommend to anyone that loves tea and mysteries. I admittedly haven't read the other books in this series, but after reading this one I will definitely check them out. Reading one of these books with a tumbler of tea on the beach would be an ideal summer afternoon. If this book sounds like something you'll pick up, stay tuned to win your very own copy! Next week I will be doing a giveaway! Thank you to Laura Childs for the book! You can learn more about it here.